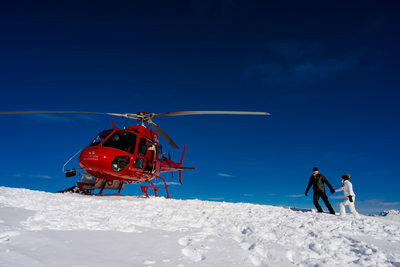 Adventure wedding photography is best described as going to great lengths to find the extremes for the photos of weddings. Imagine all of your friends have gotten married in the traditional way with the ceremony in the church, the photos taken at a park nearby or interesting building that has some character and the reception is held with a couple hundred of their family and friends. Though each one is a little bit different it is comparing very similar events to each other and the photos though beautiful, are similar. You decide you want to do something completely different and want photos to show off your creativity and adventurous spirit so you want to take pictures in your wedding dress in a location that none of your friends have, and possibly nobody has. This is the spirit behind adventurous people in that they want to push the limits, blaze new trails, do something others think impossible and in this case, have the pictures to prove it. Sherry and I love this spirit as we have always jumped in with both feet to whatever we do in life and that makes us the best adventure wedding photographers. We love to travel! We have spent our married life going from place to place and though we may have a home where we store our stuff, our bodies are usually on the go, and our hearts certainly are always on the go. We continue to think about the next place, the next adventure, the next bit of amazing landscape we will find and we make that a benefit to our clients. 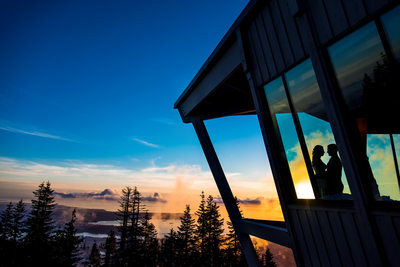 We plan several Couplescape trips each year to destinations around the world and open it up to our clients and people wanting images in some of the world's most interesting places and through that we have explored, hiked, climbed, rode, walked, trekked, laboured, and fought to get to places that are amazing. From deserts to mountains, oceans to forests, we have gotten there, and had the fortitude to capture elegant beauty in those places. Sometimes the trek is a long drive down not so good roads to arrive at a lookout and wait until sunset or until the light is just right, sometimes it's packing up all of our gear and heading into the mountains with a plan in mind but a destination that reveals itself as we go. Whether it is a tropical destination like Jamaica, Costa Rica or Mexico, a National Park like Death Valley or Yosemite, a Canadian destination like the Rocky Mountains, Morraine Lake, Peyto Lake, Yoho National Park, Whistler, Newfoundland or the Great White North, or an overseas destination like Italy, Rome, Amalfi Coast, Lake Como, France, Paris, Israel, Greece, Santorini, Turkey, Croatia, or the mountains of Africa, Tanzania, Mount Kilimanjaro, China, Hong Kong, Vietnam, Angkor Wat, Machu Picchu, New Zealand or any mountain peak we can get to whether by hike or by helicopter, we are ready to be there with you creating stunning portraits of you in your flowing white gown and bespoke tuxedo. We have long described our style as a little bit of Vanity Fair meets National Geographic. We are always looking for the best lighting, location, posing and clothing that will compliment each other into creating stunning works of art with you in them. For years we have studied each different aspect of photography including learning how to pose like models do so we can show our couples what we want from them. We have learned from some of the world's best landscape artists into how to get the most out of your landscape and how to wait and plan for the right time of day and the light that is going to showcase the landscape the best, and the up to date fashion of what looks amazing today and will continue to do so tomorrow. 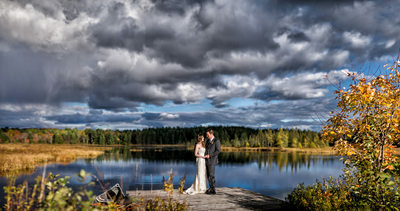 We focus on the light, mood, texture, colour, and composition of photos while incorporating our years of knowledge into creating a fairy tale world for your wedding pictures. To give you an example of what this can look like and the lengths we go to in order to get the shot I want to tell you a story of how we captured this photo. The moon shot as we now call it was an idea that I had and it kept coming back into my mind. I had to capture it. So we started planning it. We had to learn about specifically how the moon moves around the earth at different times of year, how quickly it moved across the sky, when it was going to look biggest, how haze and humidity would affect the shot, at what angle the location we found had to be in order to capture a couple in front of it and what lenses and equipment we would need to make it happen. It all came together one year on a June supermoon where the moon is as close to the earth as it will be any time through that year. 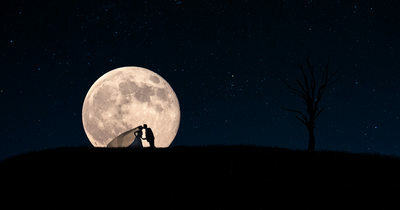 It was decided we had to be 600-700 meters away from the couple with the camera, had to use a 1200mm lens on a tripod and be out there at dark as the moon rose. We found a family who graciously let us use their property after we searched all over the place for a location with a hill that was in the right place and didn't have any trees behind it so we could capture the silhouette, and got in position and waited for the moon. The rest is history and we got the amazing photo we were hoping for, but what you don't know of the story is we planned to do the shot over several days just in case we were clouded out on one of the days and the second night I was standing out in the field in the pitch black waiting for the moon when I saw a little white nose walking up towards me and the camera. Unfortunately I determined it was a skunk and I wasn't sure what to do. A quick call to Sherry gave me the answer I was definitely not looking for. "Sherry there is a skunk at my feet what do I do?" "Take off your pants!" "What??!!" "If it sprays you your clothes will be wrecked, and I really like those shorts, so take off your shorts!" Not exactly what I was expecting, but I did, and it never sprayed me, but we were able to capture the photo yet again that evening and we had a great story to tell afterwards. We would love for you to come and join our little bit of crazy and together do what others haven't. Some say this is crazy, but we think it's wonderful. There are many things to consider and plan when choosing to do something that is out of the box. Following is always easier, leading has challenges. We have solved many issues over the years and are happy to lend our experience and muscle to the task. Often times we recommend the bride and groom to hike in proper hiking clothes and we carry the dress, tux, shoes and jewelry along with us to the location where we have you change into the glamorous attire. This way you don't have to worry about things getting dirty, and yes we are more than happy to help carry the essentials and help you along the way getting to where we want to go. 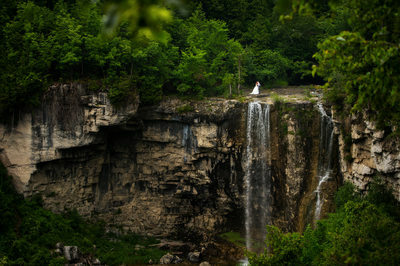 Another is whether or not to get married in this amazing place or just have photos taken. There are officiants who would gladly make the trek with us where you can elope at the destination, or we can go and take photos and have the official marriage take place at city hall or a church or a big reception. Either way we would create one of a kind pictures of the two of you starting your new life together. Some will get married at the spot, then have a social gathering with all their family and friends back in town when it is most convenient. We would love to help you along the way and can do so by giving suggestions, help with the planning and even help with the travel options, accommodations and such. We want to walk with you in this adventure and would love for you to drop us a note and we can get started with everything from where to go, how to get there and what to bring. Let us help you create the photos of your dreams.